Generally sunny. Warmer. High 79F. Winds S at 10 to 15 mph..
Mostly cloudy skies. Low 59F. Winds S at 5 to 10 mph. The 2019 Fredericktown High School girls soccer team celebrates winning the Hillsboro Tournament, the first tournament championship in program history. From left, Abby Parson, Alayna Buxton, Arika Buxton, and Alivia Buxton are selected to the all-tournament team. Fredericktown's Kayleigh Slinkard battles a Hillsboro defender for the ball. 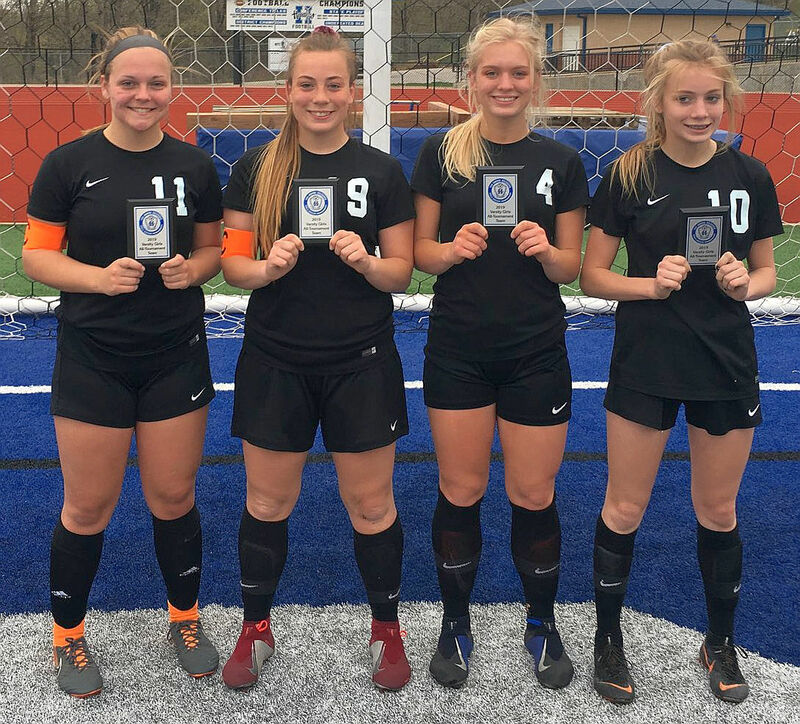 The Fredericktown High School girls soccer team improved to 13-2 as they won the Hillsboro Tournament Championship, with a 3-1 victory over Cape Central, Saturday afternoon. The Cats simultaneously broke the the team's single-season record for victories in a season and won their first tournament of any kind in program history. Alivia Buxton scored 38 seconds into the match, giving her 20 goals on the season and giving the Cats a 1-0 lead. Arika Buxton scored 20 minutes later on an assist from Kayleigh Slinkard to make it 2-0. The Tigers trimmed the FHS lead to one with a goal late in the first half. Alayna Buxton scored for the Cats in the second half to restore the two-goal lead. Kyndal Dodd made two saves in the victory in goal. Alivia Buxton and Alayna Buxton added assists for the Cats. Abby Parson and Alivia Buxton each had four steals, and Kylee Bastie had three. The Cats reached the tournament championship by sweeping their three matches in pool play, last week. Monday, they defeated Ritenour, 10-. Tuesday, it was a 3-0 victory over the host Hillsboro Hawks, and Wednesday, the Cats topped Kelly, 8-2. Parson, Alivia Buxton, Arika Buxton, and Alayna Buxton were selected to the all-tournament team.